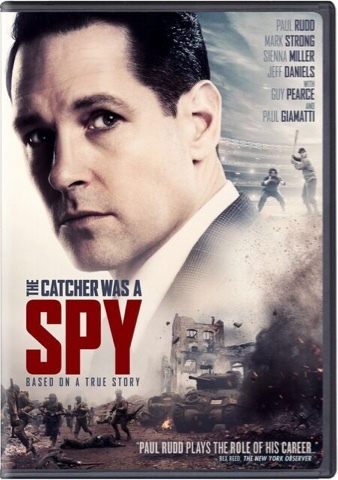 Paul Rudd stars as Moe Berg in the incredible true story of how a professional baseball player became a World War II spy. A Jewish, Princeton-educated, multilingual catcher for the Boston Red Sox with a closely-guarded private life, the enigmatic Berg was already a man of mystery when, in 1944, the U.S. government's wartime intelligence agency enlisted his services. His mission: go behind enemy lines in Europe to assassinate the Nazi's chief nuclear scientist before the Germans develop an atomic bomb. Trading in his catcher's mitt for a trench coat, Berg must rely on his formidable, steel-trap intellect in a high-stakes game of cat and mouse—with the fate of the world hanging in the balance. Mark Strong, Sienna Miller, Jeff Daniels, Guy Pearce and Paul Giamatti costar in this remarkable slice of forgotten history. THE CATCHER WAS A SPY is rated R for some sexuality, violence and language. The film will be available on DVD with deleted scenes or on Digital beginning October 2, 2018.